Welcome to the world of interactive audio. With the X Rocker Pro H3 4.1 Wireless Audio Gaming Chair you can now not only hear your music but actually feel it. Whether you are listening to music, watching a movie, or playing a game, you will become a part of the excitement. The X Rocker Pro H3 has four speakers (more than any other X Rocker!) and a subwoofer that uses Ace Bayou's innovative Audio Force Modulation Technology. AFM incorporates speakers and ported power subwoofers and uses the open space inside the X Rocker – not just the frame – to magnify sound quality and intensify your experience. The X Rocker Pro H3 also has additional vibration motors that sync with your audio's bass tones to create an even more powerful full-body sensation. 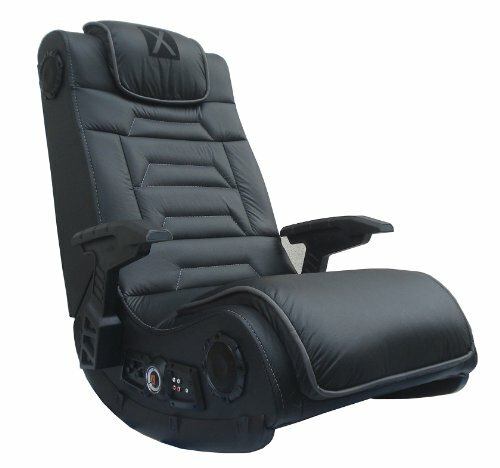 The fixed-position gun-stock arms provide extra stability and the heavy-duty padded backrest and headrest will keep you comfortable for hours of gaming. Control panel includes separate volume, bass, and vibration controls, and input and output jacks for connecting to your audio source and to other X Rockers for multi-player games. The wireless receiver is built-in and the box includes your wireless transmitter that will send audio from any source with headset or RCA outputs to your gaming chair. Optional RCA cables also included. Some assembly required. X Rocker brought to you by Ace Bayou.